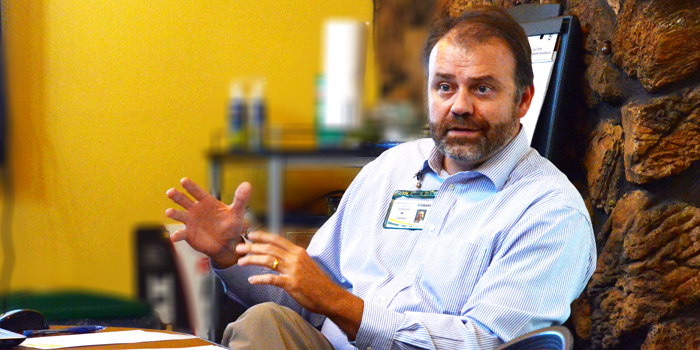 Tippecanoe Valley Superintendent Blaine Conley discusses the upcoming agenda with board members on Thursday, Oct. 4. AKRON — During an informal work session with the Tippecanoe Valley School Board, Superintendent Blaine Conley gushed about the past week and its impact throughout the district. “It’s just been a really great week at Valley in terms of what’s been going on,” said Conley. The five board members met at the school corporation’s administration building on Thursday, Oct. 4 to go over recent activities throughout the corporation and to receive a preview on next week’s regular board meeting, scheduled for 7 p.m. on Monday, Oct. 8. The board heard a preview of a number of presentations that will be made on Monday, including reports on accomplishments from the high school’s FFA chapter and unified sports teams, as well as upcoming donations from the Good To Go oil company and the Sweet and Sassy golf outing and the results of a motivational speaker who presented at several of the schools. Conley told the board members that the high school’s FFA participants recently displayed their prowess at state and local competitions. Four students — Sarah Tucker, Branden Dugan, Rolonda Richard and Chloe Hostetler — placed second in an area livestock competition. Soil student Amber Evans, Hailey Backus, Brandt Alber, Sydney Petersen, Cheney Canada, Makenzie Woodcox, Sarah Kelley and Nicole Ziemek advanced to state competition, according to Conley. Conley said the high school’s unified flag football team competed in and won the sectionaI title Sept. 31. The team consists of Hailey Hale, Cheyenne Barngrover, Arianna Wright, Andrew Thompson, Connor Frentzel, Tanner Trippiedi, Cade Brouyette, Tyler Nine and Nathaniel Heckman. The team advanced to the regional a home against Griffith on Saturday, Oct. 6. Conley told the board that inspirational speaker Nathan Harmon spoke to the students at the high school and middle school earlier in the day. Harmon talked to the students about his past experiences in overcoming overwhelming adversity. Conley said Harmon kept all students interested throughout his presentation. Conley also told the board members that the school will be receiving donation from several different sources, including a grant from the oil company for $4,750 to be used for school safety initiatives, as well as a donation of $26,600 from a golf outing held in honor of the late Scott Bibler, former teacher, counselor and coach at Tippecanoe Valley High School. “It was the largest golf outing in Kosciusko County with 53 teams,” said Conley.